Friday was a beautiful sunny day. One of those days that puts one in a good mood and ready to try something new so we ended up at Chez Nestor. One of Marbella’s oldest French restaurant, Chez Nestor was located in Puerto Banus for years until their recent move to the Vasari resort. This restaurant was always spoken of and recommended by the local French community and we finally had the chance to have lunch there. The interiors are cozy and overlook the pool area where in the summer, it must be perfect for an al fresco meal. We sat right by the bar and decided to just order one course as we had were meeting friends that same evening and were getting ready for a full dinner. There were several things on the menu that caught my attention – confit de canard, goat’s cheese salad, oysters, foie gras – but I chose steak tartar and A had his favorite, andouillette (smoked tripe sausage). The tartar (as you can see in the photo) was a large heart-shaped portion of ground steak, perfectly seasoned and spicy, just the way I like it. 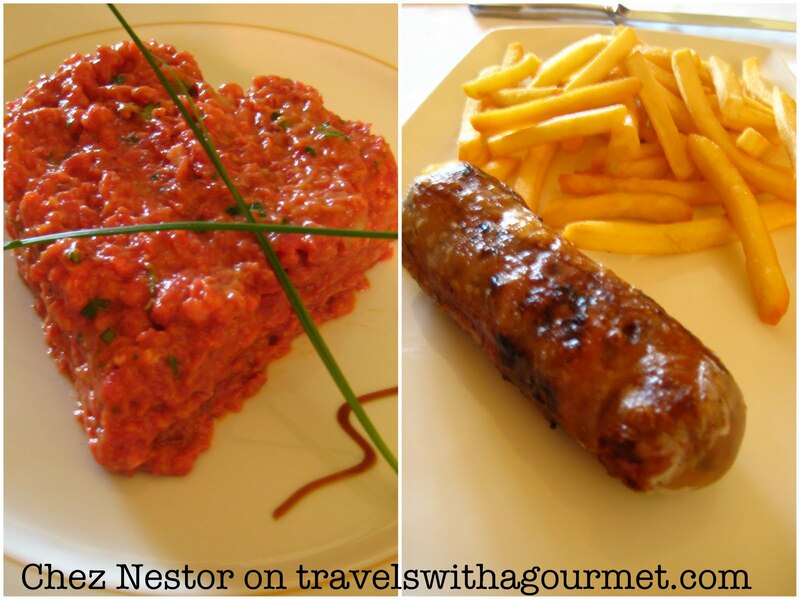 The andouillette was a crisp-skinned sausage stuffed with tripe which A really enjoyed. We skipped dessert and coffees and promised to come back soon – perhaps on Wednesdays when they have their famous couscous and next time, I’m having the ile flottante as well. Egalement nous communiquer les prix . Hi Tim,I keep hearing about that famous roast chicken too but it wasn't on the menu when we were there the other day. Apparently there is also a couscous day that you need to book a table in advance for. The new location is bright and must be fantastic in the summer with all the outdoor tables. Thanks for checking in! Goog to hear Chez Nestor is alive and well, I had heard that they had closed down the old location. Their roast chicken is outstanding.